The report generator creates automated summaries of analytic results based on a search query or topic definition. It makes use of webLyzard’s portfolio of high-quality visualizations to produce professionally designed PDF reports. 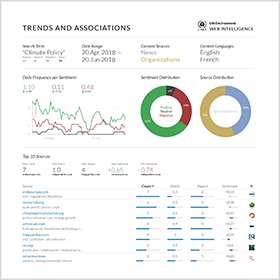 Optimized for print, such reports widen the platform’s target group beyond the users of the interactive dashboard and unlock many new application scenarios. Automated reports can serve as weekly management updates, for example, or as comprehensive on-the-fly briefings on recent events or the social perceptions of an issue. Trends and Associations. Two line charts on the left show recent trends in daily coverage per sentiment category and source – complemented by a third chart on the right to compare sentiment across sources. Colored indicators represent average values, small numbers next to the arrows the change between the first and last day. Two donut charts depict the overall distribution by sentiment and source. Underneath, a tag cloud and keyword graph summarize the most important semantic associations with the search term. Cross-Media Analysis. A scatterplot and frequency-sorted table present the top sources reporting about the search term. The size of the bubbles shows the overall reach of a source, their color ranges from red (negative) to grey (neutral) and green (positive). 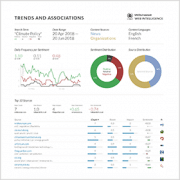 The table includes the top 3 keywords that a given source associates with the search term, the number of mentions, the reach of the source, the impact of the coverage (multiplying reach and the number of mentions), and the average sentiment expressed by each source. Opinion Leadership. Similar to the cross-media analysis, the scatterplot shows how often persons were mentioned together with the search term, and whether this was done in a positive or negative context. The size of the bubbles indicates a person’s overall number of mentions in the chosen time interval, independent of the search query. The table lists the identified opinion leaders together with associated keywords, the number of co-occurrences with the search term and the average sentiment of these co-occurrences. 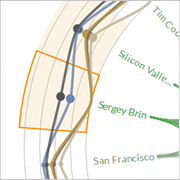 Geographic Distribution. The regional distribution of search results shown on a geographic map is followed by a corresponding list of locations (countries, states or cities) that are most frequently mentioned together with the search term – including top keywords to highlight regional differences in the coverage, the number of times a specific location is mentioned together with the search term, and the average sentiment of these mentions. Sentence Analysis. Three tables show the most recent, the most positive and the most negative sentences that contain the search term within the chosen time interval (filtering out redundant or very short sentences). The tables are followed by a word tree, which is a graph-based tool to quickly grasp the major threads in a public debate. The branches on both sides help to spot important expressions that often precede or follow the search term. The sentence analysis report is not available for asterisk (*) wildcard searches. The Export drop-down of the dashboard’s header menu provides access to the PDF reports. Users can create individual reports or convert them into a single multi-page document that includes all the available reports. Last major update with release 2018-06 (Panther Chameleon).